Asus has announced three new monitors at Computex 2018, two for gamers and one aimed at creative professionals. 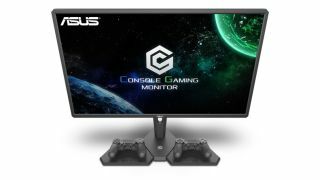 Rather than just targeting PC users, Asus is going after console gamers, and specifically PS4 Pro and Xbox One X users, with its 4K CG32UQ gaming monitor. The Asus CG32UQ clocks in at 31.5 inches with a traditional 16:9 aspect ratio. Larger than a office monitor but smaller than a living room TV, the aim is to strike that middle ground for bedrooms and offices of gamers who want plenty of pixels. With Adaptive Sync and HDR10 on board the gaming credentials of this monitor are great, but so too are its media playback capabilities. Hook this thing up to a soundbar and you’ll be able to enjoy a broad range of visual tones when viewing compatible content from the likes of Netflix and Amazon Prime Video. If you’re a PC gamer and want something a bit wider, there's also the VG49V with its 32:9 aspect ratio. It has a huge 49-inch display and features lightning-fast 144hz refresh rates, adopting AMD’s FreeSync tech. The 3840 x 1080 resolution makes it double the width of regular 1080p monitors, and with its 1800R curve it should offer an intimate experience edge to edge despite its size. As for connections, the VG49V’s sports one DisplayPort 1.2 and dual HDMI 2.0 inputs. For more casual gamers and general users who still want size and specs, the new Asus ProArt PA34V packs a punch with its 21:9 aspect ratio, 34-inch size and UWQHD resolution (3440 x 1440). The 100Hz refresh rate is respectable for gamers while the promise of heightened color accuracy looks set to keep digital professionals happy. Offering advanced ProArt Calibration Technology, the customisable color profiles can he saved directly to the monitor and Asus even offers a guarantee of calibration quality before it ships. For creative professionals like video editors and photographers, their monitor isn't just the canvas that displays their work but an essential tool, although many freelancers and prosumers who work from home want that same screen to serve up games and entertainment when they're not working. The ProArt PA34V is brimming with connection options, offering a Display Port 1.2 and two HDMI 2.0 ports, as well as two reversible Thunderbolt 3 ports. Asus hasn’t given anything away with regards to pricing and availability, so watch this space, but the Taiwanese tech giant has announced a lot of other cool stuff here at Computex 2018, so be sure to check out all our coverage from the event.